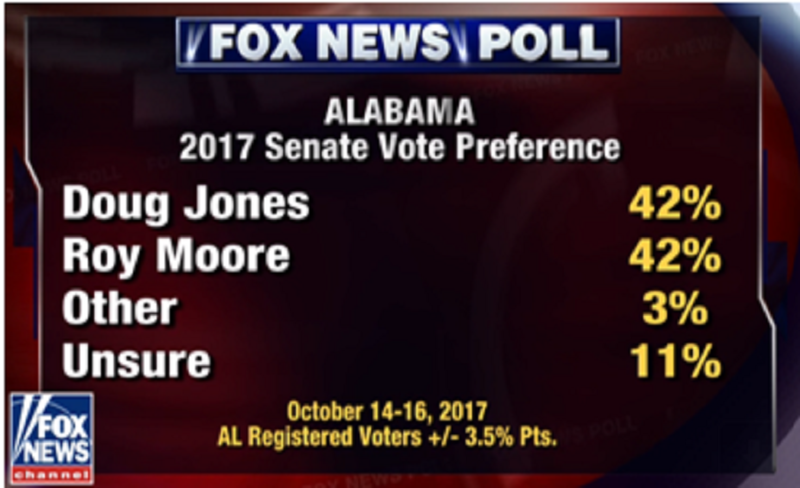 The latest Fox News poll of the U.S. Senate race has conservative Judge Roy Moore locked in a dead heat with liberal Clinton-era lawyer Doug Jones, 42% to 42%. That’s a gut check, because this is a state that President Trump carried by 28 percentage points! This spells Trouble with a capital “T”. But you and I know the truth. The truth is that Mitch McConnell and his minions spent 21 million dollars spreading filthy lies about Judge Moore all over the state to try to defeat him in the primary and keep their lackey in the race. They ran his negatives through the roof. They called Roy a liar and a thief. They claimed he stole from charities and married a grifter. They dragged his children into the race, parading his son’s misdemeanor hunting violations around at every political meeting and in whisper campaigns all across the land. In hushed tones they told reporters he was mentally unstable, and actually believed in GOD. 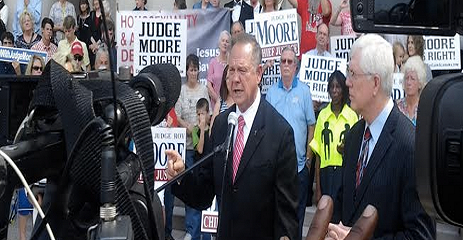 When their own, hand-picked candidate got blown out by Judge Moore in the primary runoff, they CLAIMED they would rally around Roy and support him in the general election. But as with everything the establishment does, they LIED. They have not lifted one finger or spent one cent to try to rehabilitate the damage they shamelessly did to Judge Moore’s reputation in this state. They trashed and defamed him from Muscle Shoals to Bayou La Batre, and from Dauphin Island to Zip City. They’ve done it before, and they will do it again. Trash the conservative. Spend millions tearing him down, then blame him when he loses. Because he was too conservative. With Roy Moore, conservatives are poised to pick up a Senator who actually owes the Washington, D.C. crowd NOTHING, and will go to Washington pledging never to support Mitch McConnell for Majority Leader. But it’s a start that will never happen — unless we supply the cash that McConnell is refusing to supply to help Judge Moore weather the storm the establishment’s 21 million-dollar campaign of lies unleashed. It’s unthinkable that this sure-bet special election to replace Jeff Sessions in the Senate could actually result in LOSING the seat — in a state President Trump carried by 28 percentage points. At a time when our Senate majority is TWO seats. But if the Drudge Report and Fox News are right, that is a very real possibility, with the candidates shockingly locked in a 42% to 42% tie with only weeks to go before the special election. Special thanks to John G. Mathis, an American politician and a Republican member of the Utah House of Representatives representing District 55 since January 1, 2005. John has been alerting conservative organizations and publications about the plot to stop Judge Moore from becoming another GOP member of the U.S. Senate.